As the leader of a powerful merchant clan, you must carefully plan the trade routes that will bring wealth to your family. Build fleets and caravans to control commerce in key cities and vie for rights of passage to your rivals' islands. 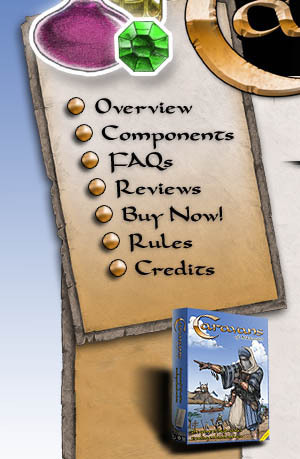 Caravans of Ahldarahd is a boardgame set in a fantastic realm of desert kingdoms. 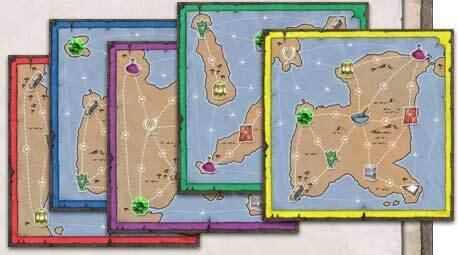 Each player has a unique gameboard with a mix of advantages and disadvantages. As you plan your strategy, you must choose whether to secure monopolies in your own region or throw caution to the wind and deploy your traders to distant ports. Your deals with fellow players will ultimately determine your success or failure. Choose one of five maps to begin your empire. The resources you need to build your trading empire can only be acquired by the highest bid, so you must balance fast expansion with longterm planning. If you strike too soon, your control may be easy to challenge. But if you wait too long, the game could end before you're able to fulfill your plans. In addition to resource and route management, players can bid for the favor of the mighty Shah, the zealous Eyes of Shamesh, and the mysterious Pirate Queen to secure special advantages. Meanwhile, each person's map can be invaded by any opponent controlling its Right of Passage card. The position of your allies changes from turn to turn, so those who ignore the political play can find themselves at a disadvantage.